Our family has Friday family night, which usually consists of going out to eat since by Friday neither of us feel like cooking dinner. We have three children ages 10, 7 and 2 years old. 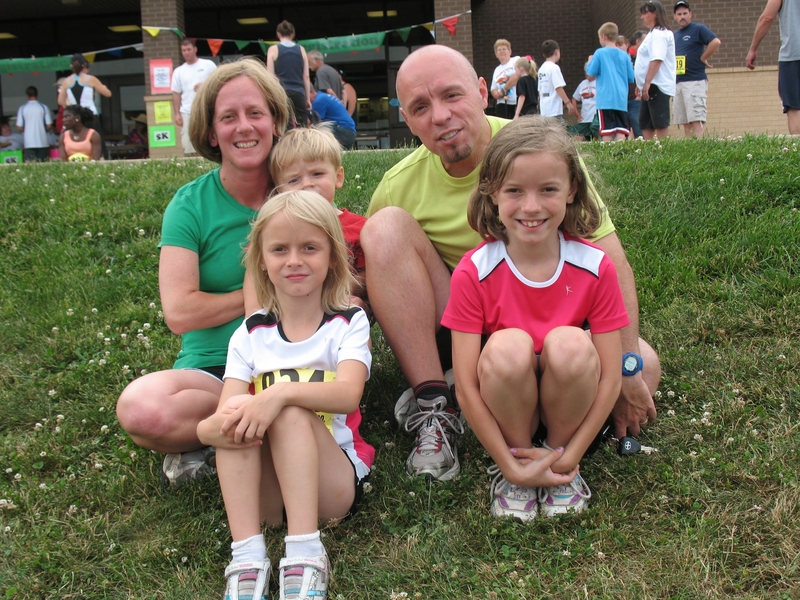 On June 3th we spent our family night at the Tiger Classic 5k race in Bristol Pa. This race is special to our family because it is the race my husband and I met at. In 1992 the race was 10K held on Memorial Day. My husband won that race and I finished 2nd in the women’s race. After the race we got talking, found out we lonely lived 2 miles apart and the rest in history. At one time we both held the 10k course records. We have traveled back to the race every year. The girls like eating the goodies after the race and especially enjoy picking prizes from the tables of stuff the race offers. The race was held on a Friday evening. The temperature was great better than a week ago when it was in the 90’s. Shelby and Paige have run several 5k’s Shelby ran the race solo because my husband ran with our 7-year-old daughter Paige. As Shelby approached the finish on the track a the crowds cheered I heard someone say look at that little girl. She tried with everything she had left to catch the lady in front of her but the lady told us later she gave everything to stay a head of Shelby- “I could not let a little girl beat me”. She won the girls 12 and under age group with a time of 28:05 (actually beat the boys in the age group as well. As Paige approached the finish line the crowds cheered for her and once again I heard runners say look at the little girl she is even talking. The runner in front of her said she worked hard to stay ahead of Paige because she couldn’t let a little girl beat her. The female runner told me she “looked back once and saw a small girl running and talking not out of breath while she was feeling exhausted. She worked harder because she was worried the little girl would catch her and pass her”. She was 2nd in the 12 and under age group with a time of 32:22- first place was her big sister. She ran 6 1/2 minutes faster than lat year at the same race. I also won my age group but the little ones stole the show. To top off our evening we stopped for ice cream on the way home. The girls earned a large ice cream. Both our daughters think nothing running a race. The incredible thing is they don’t train at all. They sign up for a race, the week before run 2 miles and them race the 5k. Months later the same thing for another race. We want them to enjoy what they are doing after all most sports use running as a punishment. They view it as something they can do that most adults wont do. The Tiger race next year may have another Daugherty entered. Miles is only turning three in September but he runs around trying to keep up with his sisters, so the 1 mile should be no problem for Miles. Look out Girls Cross Country team competitors in 2017 the Daugherty girls are coming. Running articles to help you train better in 2011. These articles are suitable for the novice to the elite runner. One even helps to get your children to start running making it easy and fun. Even an article for pregnant women to help then train without worrying about the little one. Click below to check then out! Ben Colmen is a remarkable young man who has had lots of challenges during his life. This young man just wanted to be on a “team”. Ben has cerebral palsy. He could not find a team that was willing to work with his limitations. One day he found cross-country, started to run and now has won the hearts of his competitors. Cross country is a sport that anyone can fit into. You don’t always have to be the fastest runner on the team and this video will prove that. Having children and running can sometimes be a challenge. Every runner with children should look into getting a jogging strollers. Being a runner and mother of three children it was important to me to get a jogger, even more important than getting a regular stroller. All three of my children have spent lots of miles in the jogger here are a few tips to make the run easier on both of you. It’s always important to be safe when running but when you’re running with a jogging stroller, you have even more reason to be cautious. Here are some tips to make running with a jogging stroller easier, safe, and comfortable for you and your little one. It’s not safe to run with a child under six months in a jogging stroller, unless your stroller has a car seat adapter. Using the jogging stroller with the car seat means that the baby’s head and neck will be stable and he won’t get bounced around too much. There are two types of jogging strollers one’s that have a fixed front wheel, while others have a swivel wheel that has a switch that allows you to lock and unlock the wheel. When you’re running with the stroller, it’s safest to lock the front wheel in place. This will prevent the stroller from turning suddenly and causing you to crash or fall. Your child should be sitting in the upright position not laying down. Most jogging strollers have a basket underneath, and lots of other compartments. This give you plenty of room for things you might need during your run. Things like diapers, wipes, water (for you and your child), snacks, and a toy or book to entertain your child. Snacks are a great way to keep a toddler happy. You will warm up because you’re running, but your child will not. Bundle your child up in the cooler weather. If it’s cold and windy, you may want to use a weather shield for your stroller. On warm days, make sure your child is not overdressed and protected with the stroller’s visor as well as sunscreen. Keep your runs short on very cold or hot days. The harness will protect your child from falling out. Even if you’re not moving fast it doesn’t take much only a quick turn the child is not expecting and they could be jostled out of the seat. The harness will also prevent them from being able to reach out and get their fingers caught in the wheels. It is a good idea to run in parks, bike paths, or other areas where the roads are closed to traffic. If you don’t have access to parks run on the sidewalk instead of the road. Try to avoid roads that don’t have much of a shoulder. Before nap time is often a good time for a run because the movement may put your child to sleep. It’s not a good idea to try to run right before a meal, when your child will be hungry and may not want to sit in the stroller. You may be tempted to push your stroller a little and let it go, so you can run hands-free, but it’s not a good idea. The stroller could get away from you, making it unsafe for your child and anyone else around you. You could hold with one hand while the other hand is free after a few strides switch hands. Many jogging strollers have a strap you can put around your wrist in case for some reason you accidentally let go the strap will stop the jogger from going any farther. Expect your pace to be slower sometimes up to one minute or more per mile slower than your normal pace. But you’re burning more calories for your effort and doing some resistance training. Just like when you started running the more you run with the jogger the easier it will become. You should never be going so fast that you couldn’t stop the jogging stroller if needed. Use momentum when running down hill in such a way that you’re always in control of the stroller. Toddlers and preschoolers may get restless in the stroller, so you may want to let them out and play for a bit during the run. They’ll be much happier and comfortable with a little break mid-run. If you don’t want to stop have toys/snack packed in one of the compartment that is easy to reach and surprise them it. Sometimes pointing out things as you run keeps them busy. You can also play do you see? If you run in areas where there are farms you could say to the child do you see any cows? Some road races don’t allow jogging strollers, while others do. You will most likely have to start at the back. Running with your child can be stressful and fun. They see more of the area up close than other children in the neighborhood. My two year old son waves to all the cars as they go by us. 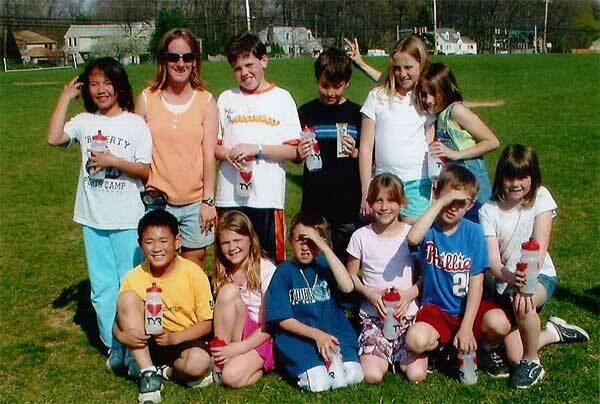 I started the Jamison Elementary School Roadrunners Running Program in 2005. The club consisted of children grades K-6 that attended the school age childcare program at Jamison Elementary School in Jamison Pa. The children ran in local races participating in the one mile fun runs or the 5K race. This simple program can help children get in shape for any sport. Week 1 – Run 1 minute followed by walk 1 minute continuing this rotation until the total time is about 20 minutes. Week 2 – Run 2 minutes followed by walk 1 minute continuing this rotation until the total time is about 20 minutes. Week 3 – Run 3 minutes followed by walk 1 minute continuing this rotation until the total time is about 20 minutes. Week 4– Run 4 minutes followed by walk for 1 minute continuing this rotation until the total time is about 20 minutes. Continue adding 1 minute a week to the running time with the 1 minute walk. If the group is adjusting quicker add 2 minutes. Running was something that improved my self-esteem. I started this group to spark the children’s interest in the sport I have learned to love. Several of the Jamison Roadrunners realized they enjoyed running and where talented runners as elementary school children. They continued running on the middle school track team and high school cross-country/ track teams. They would have never even thought about going out for track/cross-country if not for the Jamison Roadrunners program. They learned running can be fun! I started running in seventh grade (I can’t believe it’s been twenty-eight years). While in elementary school my best friend and I would bet the boys in the Presidential Physical Fitness run. After running the Presidential Physical Fitness run in gym class in seventh grade, the track coach saw my time and talked me into going out for track. I enjoyed athletics but was small so some sports seemed useless to try. I tried soccer but since I started at 12 years old the other girls had a lot better ball skills than I did. In seventh grade I ran the mile and 800 meters (the longest races in Jr. High). In high school my best friend and I went out for cross-country. We only when it was running but had no idea what cross-country actually was.I qualified for states my first year running the sport. In college I ran the 5k and 10k in track. Some of my college education was paid because I ran. Any one that has played other sports as well as run can relate to this saying. How many time did someone have to run laps because they missed a pass, or a goal, or maybe because they where late to practice. Did this ever irritate you when you heard the coach yelling at the athlete and then tell then to run laps. Believe it or not this really happens. I played soccer for Warminster township while running high school cross-country. I was often late to practice because of cross-country meets and the coach would have me run laps. Of course I didn’t mind. But how many athletes grow up and hate running. This was one thing I didn’t want my children to do. I have recently seen this saying on several shirts while at local high school cross-country invitations this year. I have two daughters ages 9 and 7 years old and a 2-year-old son. They have seen both their parents go out daily for runs even on the worst days. If it is hot we run, if it is freezing we run. We even ran when the “blizzard of the century” in 1996 30 inches hit the area we ran. W hen we had our first child we wanted a jogger instead of the more traditional stroller some relative thought we where crazy. All three of my children had logged lots of miles in the jogger before they could walk. They all had different reactions while being pushed. One yelled faster as we where breathing hard, while another lounged forward as if they where trying to help us go faster. Our son sits up straight to see more of what is going on. All three seemed to calm down and get excited when they would see us get the jogger out. My daughters have the continued the running jeans. They started running 1 mile fun runs at the age of three and finished 5k races at the age of 7. They don’t understand why other hate running. I know this is only because they have seen Mom and Dad going out for runs. I have wondered how many natural runners are out there but the individual never tries running because they had a bad experience while playing other sports. After all once your college athletic years are over most areas don’t have adult leagues for sports. Running is something anyone can do no matter how short, tall, fat or uncoordinated the individual is. Coaches should think about the saying this saying before they “punish” athletes. I am sure lots of runners out there have stories to support this saying. Our family recently ran in a local 5k race in Ivyland, Pa. Both of my daughters where excited to run the 5k and not the “baby run”. It sounds funny considering Shelby is 9 and Paige only 7 years old. They used to run the mile fun runs but now that they both have run a 5k the mile fun runs are called the “baby runs”. In most races they have to compete in the 12 and under or sometimes the 19 and under. One time when Shelby was 7 years old she finished 4th in the 19 and under age group. She thought she had a bad race but we reminded her that the age group was 19 and under, she ran against some college runners. Our recent 5k was a children friendly race, it had age groups for the younger runners. They actually have a high school team competition. They score it like a cross-country meet. Several of the local high school teams run the 5k as a tune up for the up coming cross-country season. The start is crazy because most high school runners go out to fast. I spent the first mile weaving around packs of high school runners that went out to fast. Shelby has run several 5k races and now enjoys trying to pace herself. She is only 9 years old but usually she runs her last mile at least as fast (sometimes faster) then her first mile. This race was no different she started out easy and finished strong. She was passed only a few feet from the finish line by a female adult that “didn’t want to be beat by a little girl”. The adult told us later Shelby kept her running went she wanted to stop and walk. This race was Paige’s second 5k race. She is only 7 but has also quickly learning how to pace a 5k race. The last 400 meters she was picking it up to the point that some adults would have a hard time keeping up. She was passed at the finish line by a female runner. The adult told us later “he was focusing on Paige during the race to help her not give up, after all if a little girl can run it so can I”. Both Shelby and Paige and myself placed second in our age groups. We where a little disappointed because first place received a homemade pie. Maybe next year we will all win our age groups.